Heat the olive oil in a skillet over medium heat. Add the grape tomatoes and cook, stirring often, for 2 minutes. Add the minced garlic and cook, stirring constantly, for 1 minute. Add the fresh spinach, the seasoned rice vinegar, a dash of crushed red pepper flakes, sea salt and freshly cracked pepper, to taste; cook, stirring constantly for 1-2 minutes or until the spinach has just wilted. Remove from the skillet and pour into a serving bowl. 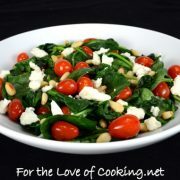 top with feta cheese and toasted pine nuts. Serve immediately with extra seasoned rice vinegar on the side, if desired. Enjoy. Side Note: To toast the pine nuts, heat a DRY skillet over medium low heat; add the pine nuts and cook, stirring occasionally, until golden brown and toasted; about 5 minutes.